City Shopping Guide for Miami and its suburbs (Aventura, Bal Harbour, Coral Gables). Brands: ANDREA MAACK, Amouage, Baruti, Boadicea the Victorious, CARNER BARCELONA, Casamorati, Dr. Vranjes, DANIEL JOSIER, Eight & Bob, Etat Libre D' Orange, ESCENTRIC MOLECULES, GALIMARD, GIOVANNA ANTONELLI, HISTOIRES DE PARFUMS, Imaginary Authors, Ineke, INITIO, Jeroboam, Juliette Has a Gun, Liquides Imaginaires, Majda Bekkali, Maria Lux, Mark Buxton, Memo Paris, Montale, MENDITTOROSA, MARC - ANTOINE BARROIS PARIS, MARK BUXTON, Nasomatto, Nobile 1942, ORMONDE JAYNE, Olfactive Studio, O'DRIU, PARFUMS DE MARLY, Parfums MDCI, Parfums De Nicolai, Room 1015, Schaf, Xerjoff. Brands: Alvarez Gomez, ACQUA DI STRESA, Amouage, Arquiste, BERIA PARFUMS, biehl.parfumkunstwerke, C.O. Bigelow, Cire Trudon**, Claus Porto, Carner, Comme des Garcons, Costume National, Costes, Ex Voto Paris, Eris Parfums, Eight & Bob, Escentric Molecules, Fornasetti, Gosha Rubchinskiy, Geo F Trumper, Hampton Sun, Heeley, Hierbas de Ibiza, Histoires de Parfums**, Humiecki&Graef, Jul et Mad**, Juliette has a Gun**, Laboratorio Olfattivo, Les Parfums de Rosine, Mancera, MALIN+GOETZ, Mark Buxton, Nasomatto, Odin, Orto Parisi, Olfactive Studio**, Panama Boellis 1924, Profumum, Roja Parfums, Royall Fragrances, ROADS PARFUM, Rodin, Santa Eulalia, The Beautiful Mind, Thirdman, Ulrich Lang, Welton London. 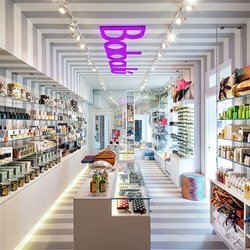 Brands: Antica Farmacista, Alora Ambiance, Bond No 9, Child, Creed, Fresh, Gendarme*, Jack Black, Juliette has a Gun, Kai, Kiehl's, Molton Brown, Odin*, Rodin, Seda France, The Art of Shaving, Tocca*, Voluspa. Brands: Agraria, Acqua di Parma, By Kilian, Bond No 9, Creed, Clive Christian, Dayna Decker, Guerlain exclusives, Houbigant, Jo Malone, Maison Francis Kurkdjian, Molton Brown, Trish McEvoy. The branch at Bal Harbour (9700 Collins Avenue (Bal Harbour Shops) ) stocks at least By Kilian, Clive Christian, Cire Trudon, Chantecaille, Dior Exclusives (Maison Christian Dior), Diptyque, Diana Vreeland, Dayna Decker, Frederic Malle, Houbigant, Jo Malone, Laura Mercier, Molton Brown, Trish McEvoy. Brands: Amouage*, Astier de Villatte**, Fornasetti, John Derian, Maison Francis Kurkdjian*. Brands: Comme des Garcons (incl. some CdG' series). Brands: Astier de Villatte, Olfactive Studio. Brands: Cire Trudon, Comme des Garcons. Brands: Agraria, Fornasetti, Parfums de Marly, Seda France, Voluspa. Brands: Baxter of California, D.S&Durga, MCMC Fragrances**. Hermes (9700 Collins Avenue (Bal Harbour Shops) / Bal Harbour) Moved to 175 Northeast 40th Street.